Celebrate New Year’s Eve – Spending New Year’s Eve in a new city is always a bit exciting, as they celebrate in such different ways around the world – some more beautiful and romantic, others more crazy and even dangerous. Some people don’t like New Year’s Eve because of all the expectations that the night usually doesn’t live up to. The best way to avoid being let down by your expectations is to simply go somewhere you know will be truly awesome. There are fun places to celebrate New Year’s Eve if you do a bit of research in advance. While the ”real” new year in Thailand is Songkran, celebrated in April, the calendar new year is also celebrated around the country, and whether you’re on the islands down south, Bangkok or in one of the cities up north, New Year is a great time to celebrate in Thailand. Last year we celebrated in Chiang Mai, where they have a wonderful market where you can sample traditional Thai foods and snacks, but the most memorable events of the evening is when people light flying lanterns which rise to the sky and mix with thousands of other lanterns, like stars. 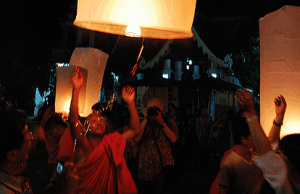 It is considered good luck to release a lantern, and they are symbolic of your problems and worries floating away – can there be a better way to end the old year than to release all your problems and worries, and starting a new year with good luck? In Edinburgh one night of celebrating the new year is not enough – there, they celebrate for four days with a festival called Hogmany. The festival kicks off with the Torchlight procession on December 30th, where thousands of torch carriers create a river of fire in the street, leading to Calton Hill. If you want to celebrate New Year in Edinburgh you can still buy tickets for the festival, and could stay at one of the many great hotels such as the Jurys Inn Edinburgh. The festival is full of fun events and shows, with a street party, concerts and live bands, the whole city comes alive and celebrate the New Year with a bang. Edinburgh hotels are known to be booked up long in advance for their many festivals, but it’s always worth a try. One of Samoa’s main draws has been the ability to stand on Cape Mulinu’u, the western-most point of Earth, and with the dateline barely 20 miles away, gazing into tomorrow. Now, all of that is about to change – Samoa has decided to change their time zone, and no longer be one of the last countries to celebrate the New Year – but one of the first. So if you want to be one of the first to experience such a strange once-in-a-life-time events, head to Samoa and see the New Year at a completely different time. Those visiting Samoa during the end of this year, will ”lose” a couple of days, going to bed on the 29th , and waking up on the morning of 31st of December, just one day away from the New Year of 2012. While it’s too late now to book a trip to Samoa over the New Year, every new year after this will be very different. Since American Samoa will stay on the California side of the dateline, you will be able to celebrate the same day twice without leaving the Samoan chain – this means that you can celebrate New Year’s eve on the same date on two different days, by taking an hour’s flight across the islands! Where are you going to be spending New Years eve this year? The new year is a time for new beginnings, and there’s no better way to celebrate than with a visit to an exotic destination. One of the greatest things about traveling is learning about new cultures, their traditions and customs. Here are some fun places to spend New Year’s Eve and online hotel booking make finding an awesome cheap hotel easy to find. The holiday season and ringing in the new year is a good time to participate in some fun experiences with new friends, no matter where you are. Each country will have it’s own unique and perhaps quirky customs that will give you great travel stories. If you’re up for a memorable and different New Year’s celebration, consider taking a trip to one of these cities. 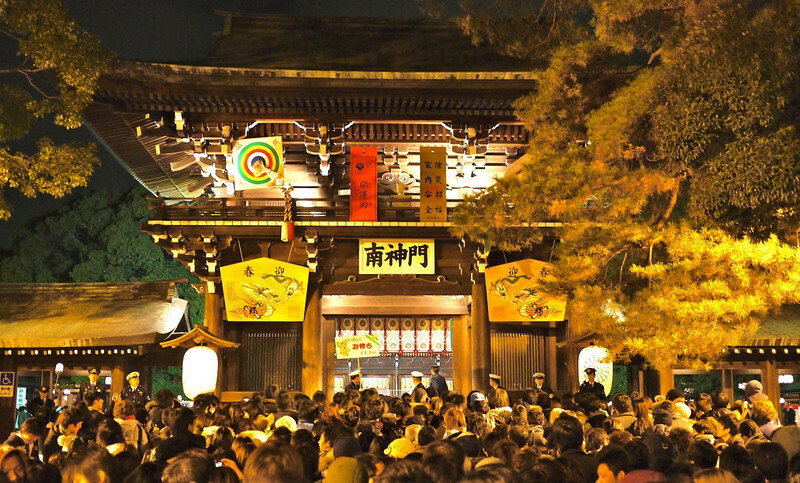 New Year’s Eve is considered one of Japan’s most important holidays. Take part in the traditional visit to a Hatsumode shrine and buy a couple lucky charms for good luck. You can also visit a Buddhist temple. Traditionally, a bell is rung 108 times to help cleanse listeners from their worldly desires. Eat long soba noodles for a long life or dance the night away in the Roppongi district. Celebrating News Year’s Eve in Rio can be a lifetime experience. Locals and visitors from around the world cluster along the beach to listen and dance to live music. 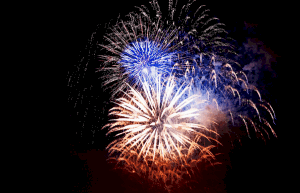 You will be able to view miles of fireworks across the beaches. Dressing in white is a must. Adding a little green gives you good health. An red will bring you passion and romance! Locals carry flower offerings and cast them into the sea at midnight thanking Yemanja for a prosperous year. Many of the beachfront restaurants stay open late. Be sure to eat seven raisins by midnight, and keep the seeds in your wallet for a prosperous new year. What better way to spend New Year’s Eve than cruising the romantic rivers of Venice. Italy tends to make food a huge part of any celebration. Their new year’s festivities are no different. Restaurant tables are packed with tremendous feasts that traditionally last from 9:00 p.m. until midnight. Don’t have a loved one to kiss at midnight? 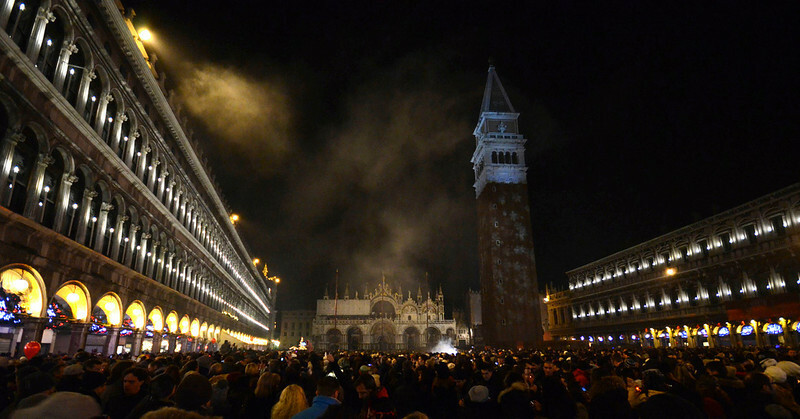 Head to St. Mark’s Square for fireworks, music, a group toast and the traditional group kiss. One of the more fun places to spend new year’s is Germany. The Germans love a New Year’s party and throw the biggest celebration in all of Europe. Start your night by making some traditional Speckdicken and share it with the neighbors. Or eat a tiny marzipan pig for good luck. Head to the Brandenburg Gate for the main celebration. Enjoy the live music, toast with a glass of Sekt, and enjoy the midnight fireworks. 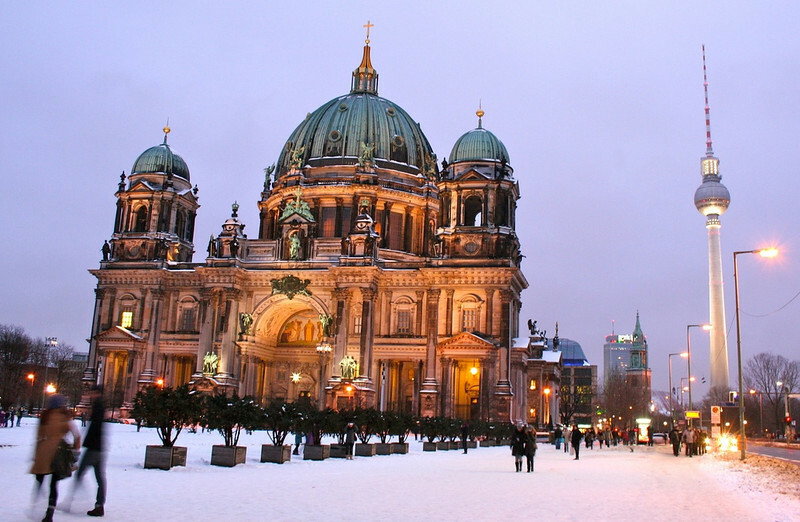 People know Berlin for it’s busy nightlife, and New Year’s eve is no different. 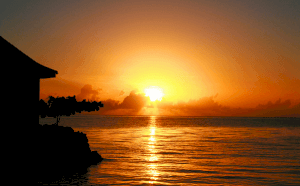 Most clubs, hotels and restaurants have special events that will carry on till dawn. One of the world’s biggest celebrations is found in Sydney Harbour with firework displays like no other. Celebrations in Australia extend for six days. They include family meetings, a visit to church and even Aboriginal rites meant to cleanse each city of evil spirits. Join the Sydney New Year beach party: camp with your friends, build a bonfire and enjoy Sydney Harbor light up with it’s world class fireworks. You can also enjoy the views from the many restaurants, lounges and the Sydney Opera House. How will you be celebrating the arrival of the New Year? Oh! I have been wanting to go to Edinburgh for New Years. I was there in Spring, and everyone told me about how cool the fireworks were from Princes Street Gardens. I always thought Hong Kong would be great on new Years. I don’t know why it just seems like they would have a great time. We’re hoping to make Edinburgh happen NYE 2013. 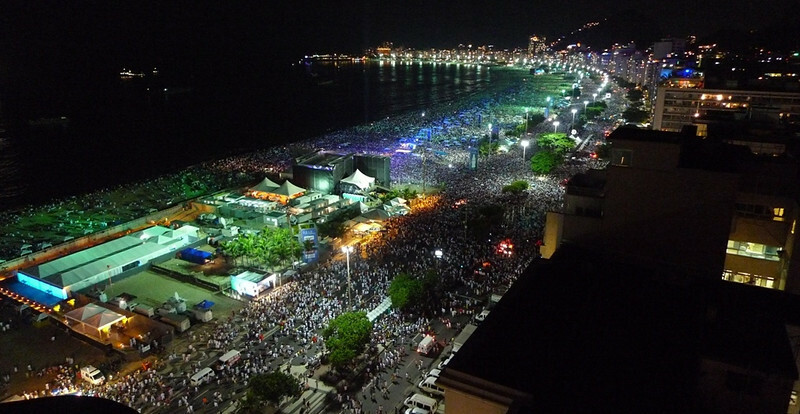 We celebrated NYE this year in Rio on Copacabana beach and it was awesome. I’d be equally excited and confused to ring in the new year twice in Samoa. Lol. Still the thought sounds cool. We’re in New Zealand this year. Where are you guys ringing in the NY? I watch the fireworks in Sydney on TV every year for New Years celebrations. It’s a wonderful spectacle with lots of vantage points for locals around the waterfront. There is also many family friendly alcohol free parks so it is safe for everyone to have a great time. Glad to see Thailand was included on there. We were in Phuket last year! Got to release lanterns and watch some wild fireworks display at the same time! Hi this article is really good. I really want to do the Samo thing but it’s gonna be impossible. Wonderful! The lantern tradition seems to be spreading slowly across the world, it’s such a nice idea that I can see why people would like to bring the tradition home with them. I love this, such different locations every time – there is nothing better than diversity! Would love to celebrate on Copacabana beach some time. We celebrated New Year’s Eve in Queenstown a couple of years back – it was a rainy mess, but they had a really nice live concert. This year we’ll celebrate in Germany, they’ve already started firing off fireworks here..! Sydney is famous for their fireworks on the bridge, would be really cool to see it in real life some time. Hong Kong sounds like a fun place to celebrate, probably some amazing firework-shows. Edinburgh is such a fun place, next time we visit we’ll make sure we go during one of these festivals as well! I’m celebrating this New Year in Cartagena, Colombia. It will be an amazing huge party where everyone in the city will be able to go to the beach get some great Colombian alcohol, partying and enjoy. That sounds awesome, hope you have a great time! That sounds like a wonderful way to celebrate the New Year, 3000 balloons in the air at the same time would make for an amazing photo! Personally I had a quiet one at home but next year we are planning Sydney! Was quite surprised that that wasn’t on your list – but then Samoa looks stunning! 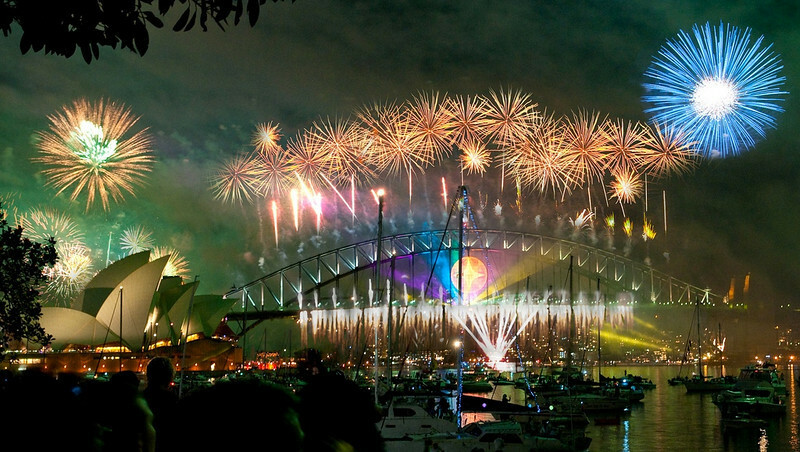 Sydney seems like a fun place to celebrate the new year, especially with the beautiful firework show on the bridges! Thanks for your suggestion, where in India would you recommend celebrating New Year? Funny, we celebrated in Auckland and it too was a rainy mess. Lol. Germany sounds awesome! These place are very nice for celebrate new year. My suggestion would be Kolkata or Delhi.But if you want to celebrate in pure western way then Goa is the ideal place.